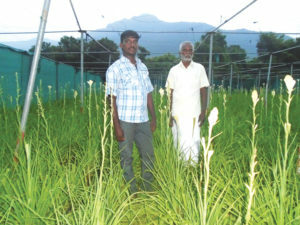 Venkatachalapuram, a small hamlet in Trichy district of Tamilnadu was known to be not throwing agriculture success stories until Sunderraj came into the limelight. All he had was just two half acres of cultivable land but with plenty of water resources. During his father’s days, paddy, nuts and sago were being grown. But yet his father never got a big deal selling the produce. That was because of a very low yield he was getting due to excessive usage of chemicals. Since Sunderraj took over the mantle, instead of getting morose and finally frustration, he decided to change over to floriculture. He chose yellow marigold for cultivation. He had reasons to take this decision. If he grows paddy, sugarcane or banana, despite toiling the whole year, he thought he will not get the required yield and consequently profits to carry on. Moreover there will be big struggle to get better price from the mill owners. His father was tired of working for getting a good price more than in taking care of his lands. He started with yellow marigold in two acres and then jungle geranium in half acre. He manipulated the planting period of the marigold in such a way that the harvest lasts for maximum months. When he wanted to know more about Jungle Geranium (Ixora), people shot back asking him what it was and whether it can be cultivated. Jungle Geranium has huge demand in Kerala and Keralite temples. Also, these two flower crops do not require much pesticides which itself would add to the profits. The additional benefits were that you need not pluck the flowers on the blooming day itself as they are capable of holding on to the plants fresh for at least 7 days and the plucked flowers will not require to be transported the same day. The price also ranges between Rs. 100 and Rs.150. Sunderraj, at present, on a particular festival day in Madurai, another sprawling district of Tamil Nadu boasting hundreds of popular temples, sells nearly 7 to 10 tons of jungle geranium . On a day to day basis, he supplies several tons to the famous Tirumala and Guruvayoor temples. Not mentioned here are several other temples located nearby receiving daily supply but in smaller quantities. As these flowers are used in almost all the garlands, the garland sellers in hundreds around Trichy place regular orders with Sundarraj. Sunderraj started brooding over the idle time he has when there are no festivals and when temples do not use much. He came out with another striking idea of planning champaka tubers in between the regular ones. There is a possibility of weeds coming up because of the tubers and hence he used porous plastic sheets to prevent weeds from cropping up. This draws some expenses but he saves on the expenses for removing the weeds. About 15 kilos of jungle geranium he harvests everyday and sells at a good price of Rs.80 per kilo. From Champaka, he gets 15 kilos per day. During the peak season, he was getting upto Rs.800 per kilo. In the off-season, the rates still will not come down below Rs.100. The December 2017 price stood at Rs.120. Marigold fetches Rs.150 price. Money changes hands immediately on sale and hence no problems like paying for labour, transportation get accumulated. There is no short supply for labour even as the payment is done promptly. As Marigold season will end by March, Sunderraj has already planted another flower variety called Crap Jasmine (Carnation of India). Barely four months after planting, he gets 3 kilos per day at Rs.250 per kilo price. He has planted 120 saplings in 20 cents area. The three kilos of harvest he is getting now will increase to 10 kilos soon he hopes. The life of these plants also will last from 15 to 20 years. Sundarraj, now the talk of the town in the agri circle, is just 50 years old, has two sons of which the eldest one with postgraduation, is lends a helping hand in transportation and marketing. But why a post graduate for this agri job, he was asked to which he tentatively answers, “ if all the educated people, after studies go for white collar jobs abroad, what will happen to our agriculture which is the feeding line for the masses?”. Sivasakthi, the eldest son was asked how he felt working alongside his father despite his good education. Promptly came the reply, “I was working in L&T finance in a good position, but when I saw my father toiling so hard with definite resources and result yielding ideas, why not work in our field and add to the family income for a double delight I thought. Now that we are deep into floriculture we can create some value added products out of our products. I am also thinking of attending a course on flower decoration which is a must in any Indian function and I hope to make use of our own production”. Sivasakthi was emphatic in his approach in abundant in confidence. What about their next plan? Yes, they are not going to rest with the present laurel. 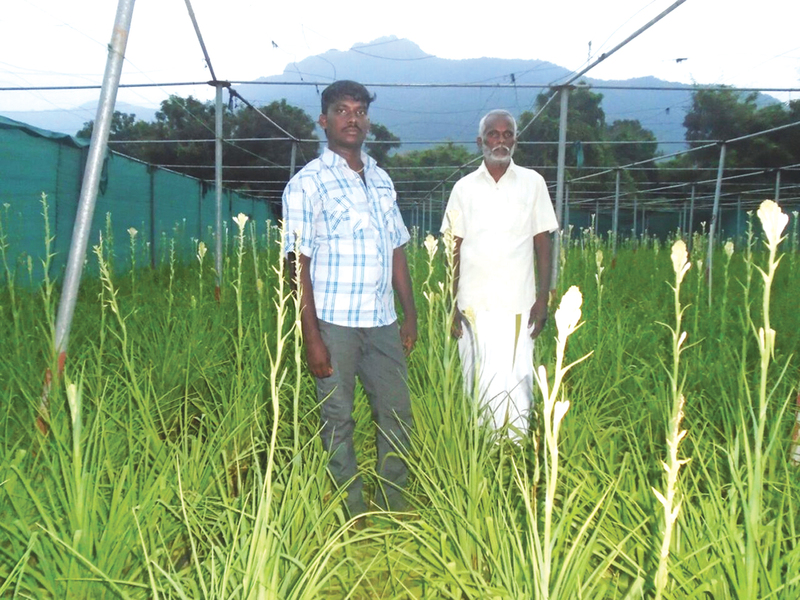 They have planned to take a 10 acre on lease and grow more varieties of flowers organically. They aim to create a record of sort that you name a flower, they have it in their land. Today many engineering graduates located around the region are feeling guilty seeing their traditional lands remaining idle. They are all making a beeline to Sundarraj for advice and many have already started growing Champa with good profits. Sundarraj has not only been making profits but he also is keen on his peers to get profits for which he hesitates to pass on his technology and experience. A self sufficient farmer is the need of the hour in any village today. Sundarraj is setting a new tone for new thinking among the increasing dissentful farmers in the villages. A new thinking, bold steps and timely grasping of opportunities will fetch enough profits to keep village and villagers’ life going well.